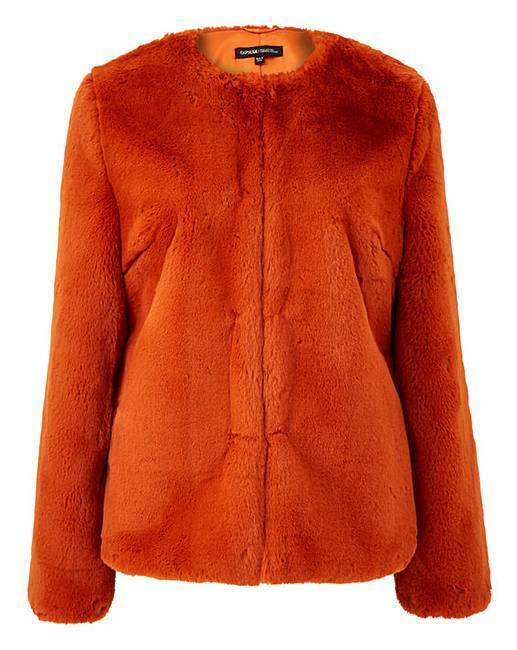 Paprika Short Faux Fur Coat is rated 4.4 out of 5 by 13. A supersoft faux-fur jacket perfect for any occasion. Wear for those cold winter days with a roll neck and jeans, or pair over your party outfit for those glam nights out. A perfect investment this season. Rated 1 out of 5 by Blameitontheweathernan from Shiny I brought this as a gift. I brought it in black. I’ve returned it now as the quality wasn’t brilliant and the fur is very shiny almost. Rated 5 out of 5 by Charliebob from Fluffeh! Love it. Soft and snuggly. Did have to go up a couple of sizes for my shoulders/arms to fit, which was frustrating though. Rated 5 out of 5 by Alex from Soooo fluffy! I absolutely love this jacket! It is the softest, fluffiest and most vibrant jacket ever. Honestly love it! Rated 5 out of 5 by SP92 from Great, but had to send back. Lovely coat, but unfortunately I did have to send it back, i realise it says “short” but I’m only 5 ft 6” and this was REALLY short, maybe should be in the petite section. Rated 3 out of 5 by Fee from Loved the material Loved the fur on this, but sadly too small for me and bit too short in length.